What is involved in making a crown? The tooth is reduced slightly in size to make room for the crown to cover the tooth. Once the tooth is reduced an impression is taken to send to a laboratory technician who will use these models to make the crown. The crown is sent back usually two weeks after the initial impression and cemented. While the crown is being made in the Lab, a temporary crown is placed over the prepared tooth, so you will not be left without a tooth at any stage of the process. Crowns get looked after just like any other teeth. In order to ensure you keep your crown for as long as possible, brush your crown twice a day and floss once. Keeping your crown clean will prevent any decay from forming underneath the crown and prevent gum disease from affecting the soft tissues surrounding the crown. These crowns are generally used for front teeth as they have a “shine” like natural teeth owing to the greater translucency of porcelain and give the best aesthetic result. Light can pass through All-porcelain crowns the same way as natural tooth. 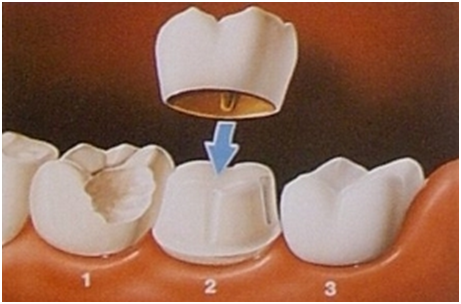 Porcelain and metal crowns involve using a metal base, with a porcelain exterior. While not as translucant as entirely porcelain crowns, they still provide a great aesthetic result and are used when a stronger material than just porcelain is required. Gold crowns have been used for many decades and are still the strongest and most durable crowns. Gold is soft on opposing teeth and wears like tooth, making gold crowns the choice for people who grind their teeth and a great choice if crowning a back tooth.